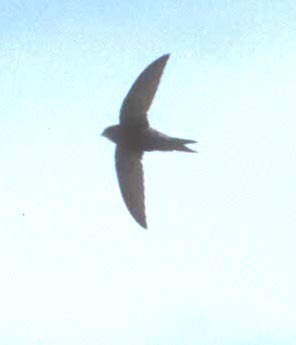 Swifts are the most aerial of birds. Dashing across the skies on scythe-like wings, they are difficult to study, let alone photograph. It has taken me years to get a decent shot of my local resident species, White-throated Swift (left). This dramatically patterned species has a far-carrying chattering call that usually announces its presence high overhead long before one is likely to spot it. In spring, pair engage in the most exhilarating of chases across the sky and when in copulation, they tumble together towards earth in a free-fall, breaking apart just short of impact to veer back up into the wild blue yonder. If your reincarnation fantasy is to come back as bird – because they can fly – then your greatest wish would be to reappear as a swift. 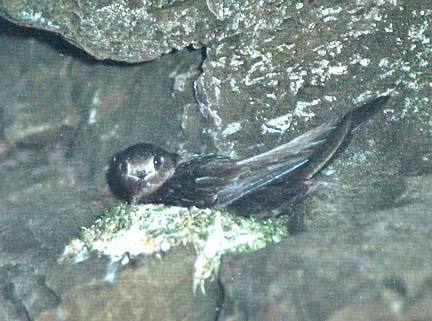 One aspect that I find fascinating is the breeding ecology of those swifts that nest behind waterfalls or within inaccessible sea caves. 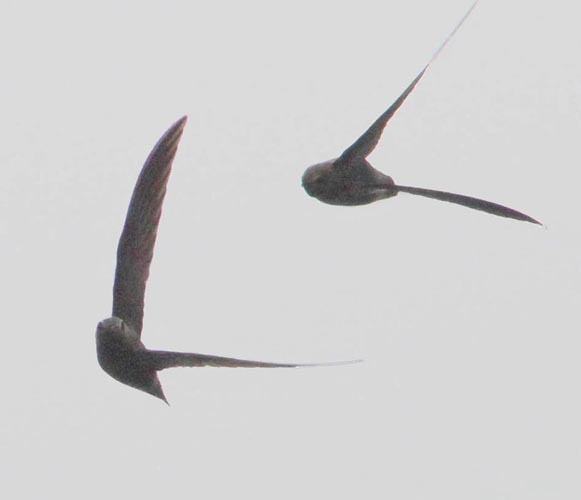 Here in the western United States, that specialist is Black Swift (right, in a great shot by Ron Branson). 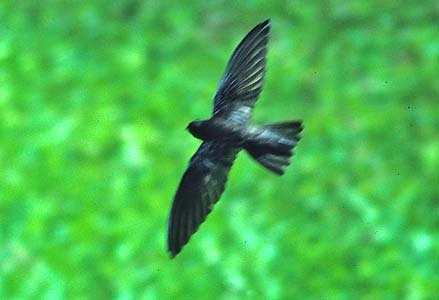 Black Swift breeds locally from Alaska to Costa Rica, and in the West Indes, but only behind waterfalls inland, or on perpendicular sea-cliffs in central California. This latter habitat provided the backdrop for Branson's photo from Santa Cruz, California (right). It pastes together lichen and moss in a small crevice, and there the female lies a single egg. Both adults feed the nestling until it is bigger than they are, until it fledges and flies. All of them, adults and young, immediately depart for the long flight to South America, where almost nothing is known about their winter behavior. I became concerned about local Monterey–Santa Cruz populations of Black Swift when many known sites became unoccupied in the 1990s. A survey of all Santa Cruz sites, organized by David Suddjian in 2002 & 2004, found no breeding swifts. Declines were also noted in Monterey County, although small numbers persist. These two Black Swift (left) were interacting near their sea-cave colony at Rocky Pt. in Monterey County. What could cause these declines? All the nest sites were well-protected; many are in State parks or Federal wilderness. I researched this question in writing the species account (Roberson & Collins 2008) in the current account of California Bird Species of Special Concern. I learned that Black Swifts almost exclusively feed their young flying ants. If the coastal California populations feeds entirely on the patchy and unpredictable swarms of these winged ants, it may be declines in ant populations that threaten our breeding swifts. Flying ants could be affected by pesticides or exotic ants, but little is known about them. The interrelation of birds and their prey is incredibly important — and it is something that we known almost nothing about for this wonderful species. 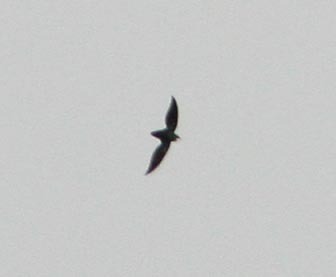 Most swifts are smaller birds and less patterned than the ones discussed above. These plain swifts include ten species in the widespread New World genus Chaetura. About half of these small species are highly migratory, including the local western North American breeding species Vaux's Swift (right). One rarely gets this close a view of these constantly-moving 'flying cigars.' You might even see the tiny feet in this shot. Those feet have strong claws for hanging onto tiny cracks in vertical surfaces, but do little else. Indeed, the Greek words that are the root of the formal family name Apodidae are a-pous, meaning "without foot" (Chantler 1999). Vaux's Swift typically nests in large hollow trees, like burned-out redwoods or douglas-firs, entering the cavity via holes made by large woodpeckers, and especially Pileated Woodpecker Drycopus pileatus (Sterling & Paton 1996). They glue their nest on the inside of the vertical surface. Recently, though, many have adapted to nesting in chimneys in northwestern California (Hunter et al. 2005). This adaptation was adopted centuries ago by the eastern species of Chaetura, the Chimney Swift C. pelagica. Species limits in Neotropical species continue to be refined. Only within this decade has the population of small swifts in southern Central America, traditionally considered a subspecies of Band-rumped Swift C. spinicauda, been considered a separate species (Marín 2000). Now called Costa Rican Swift (right), it was common over the Osa Peninsula of the Pacific lowlands of southern Costa Rica, and ranges south to Colombia. Field identification of Chaetura swifts is difficult, and one most focus on the relative paleness of the rump and throat, accurately evaluate size, or learn the distinctive differences in vocalizations. This is particularly true with vagrants. 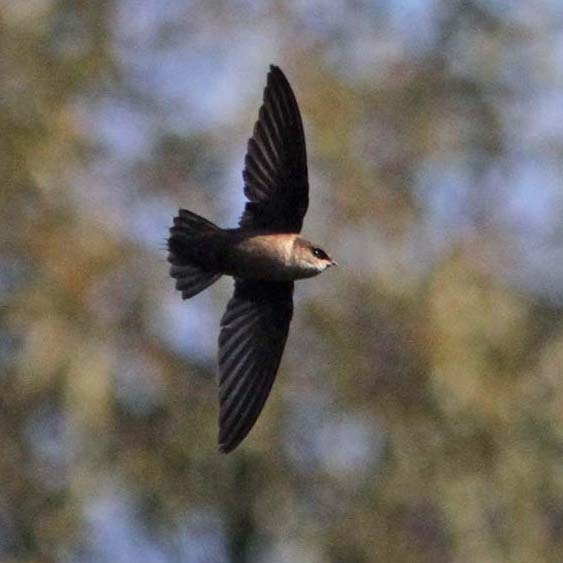 Chimney Swift now appears sporadically in summer in California, and has nested at some locales (sometimes in fair numbers), but must always be careful identified. In the Old World, the 25 or so species of Aerodramus & Collocalia swiftlets, scattered from India to Australasia, and out onto the islands of the Indian and South Pacific oceans, are an even more intractable field problem. Most identifications rely heavily on range. Caroline Swiftlet (left) occurs only in the Caroline Islands (Chuuk, Pohnpei, Kosrae) of Micronesia. There are unresolved taxonomic issues related to how many species there are, especially among the swiftlets of the Philippines, Borneo, and New Guinea, and there may even by undescribed species in the mountains of these remote islands. One set of species — Edible-nest Swiftlet A. fuciphagus, Black-nest Swiftlet A. maximus, and Mossy-nest Swiftlet A. salangana — is best separated by the color and material composition of their nests, pasted together at the entrances of caves. Swiftlets can be abundant over Borneo's Kinabatangan River, for example, but separating them in the field seems nearly impossible. Fortunately they all nest in nearby Gomantong Cave. There, Black-nest is most abundant. 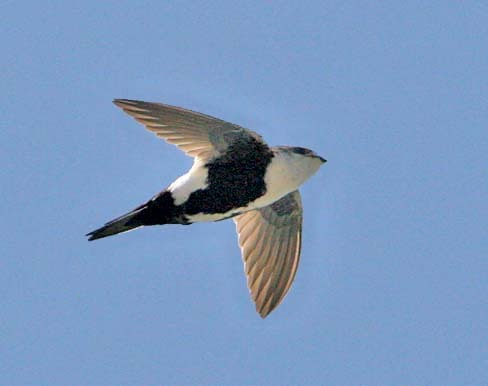 If the same levels of abundance applies to swiftlets over the river, one could make tentative field identifications there on subtle differences in size, using the appearance of the most common species to represent Black-nest and working from that. The collection of nests of the species which build edible nests (including A. fuciphagus) — the nests are considered a delicacy in some Asian cuisines — has caused significant declines in these species. Over 20 million nests are consumed in one year in Hong Kong alone (Chantler 1999). Shape differences can be important field characters. 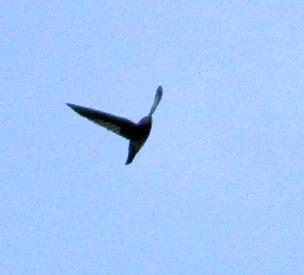 Compare the shape of these two small swifts in the Philippines: the Aerodramus — Philippine Swift (below left) — is the routine 'cigar on wings' while Philippine Spinetail (below right), in the genus Mearnsia, has a strongly bat-like profile. In the Old World, Apus is a widespread and common genus across Eurasia and Africa. Common Swift (right) is the most widespread of all, breeding from England to China (this photo was taken near the eastern edge of its range) and then migrating well south to winter in southern Africa. Although there are very common Apus swifts, others among the 15 species in the genus are rare and local, such as Forbes-Watson's Swift A. berliozi, breeding only in Somalia and on Socotra islands. There is some evidence that the smaller species are generalists on aerial insects, taking a wide variety of flying prey, because their foraging range is restricted. Larger species are able to range farther during a day's foraging, and can specialize on specific and patchy resources. Swifts can distinguish between flying prey and avoid those with stingers; Chantler (1999) cites studies on wintering Common Swifts in Zaire that showed they took only stingless honeybee drones when foraging around hives. Some of the most impressive swifts in the world are those that breed only behind waterfalls. An impressive colony of Great Dusky Swift Cypseloides senex roost and breed in the spray zone of this 400m (1300') waterfall in Chapada dos Guimarães, Brazil (left). Another favored waterfall is Iguazú Falls on the border of Brazil and Argentina; some spectacular photos of the roosts there are in Chandler (1999). As the bird forage throughout the day, one must often be at such site at dawn or dusk to see them depart or return. Mid-day visits net no swifts. Waterfall Swift Hydrochous gigas of montane Malaya, plus Sumatra and Java, is also confined as a breeder to this restricted, and highly protected, niche habitat. On a tour of Java with Ben King back in 1998, our group had to arise at 3 a.m. to begin the trek through Gede National Park to reach the waterfall at dawn — the only chance we would have to see those unique swifts. There are still many interesting swifts to see, and we are only beginning to learn details of swift ecology, echolocation ability, and taxonomy. Photos: The White-throated Swift Aeronautes saxatalis was at Salinas, California, on 26 May 2008. Ronald L. Branson photographed the Black Swift Cypseloides niger at Santa Cruz, California, in July 1971; my photo of two Black Swifts is near their sea cave at Rocky Pt., Monterey Co., California, on 6 Aug 2011. The Vaux's Swift Chaetura vauxi was at Big Sur R. mouth, Monterey Co., California, on 25 May 2008. The Costa Rican Swift Chaetura fumosa was at Rio del Tigre, Osa Peninsula, Costa Rica, on 27 Dec 2007. The Caroline Swiftlet Aerodramus inquieta was on Moen I., Chuuk (formerly Truk), Micronesia, on 30 Aug 1978. 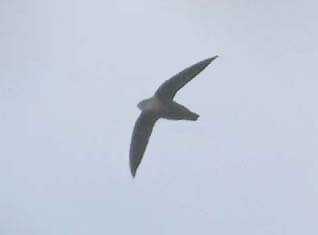 The Philippine Swiftlet Aerodramus mearnsi was at Mt. Polis, Luzon, Philippines, on 1 Jan 2006, and the Philippine Needletail Mearnsia picina was over the PICOP forest of s.e. Mindanao, Philippines, on 26 Dec 2005. The Common Swift Apus apus was near Qinghai Lake, China, on 18 June 2004. 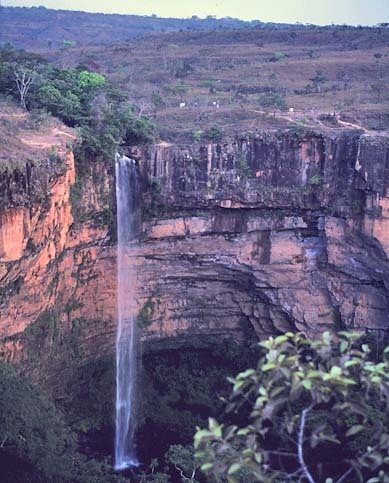 I photographed the waterfall at Chapada dos Guimarães, Brazil, in August 1999. All photos © Don Roberson except the Black Swift © Ronald L. Branson, and used with permission; all rights reserved. Chantler, P. 1998. Swifts: A Guide to the Swifts and Treeswifts of the World. 2nd ed. Yale Univ. Press, New Haven, CT. The second edition of this family volume was published in the U.K. by Pica Press, but in the U.S. by Yale. It is in the standard format of whole series of Pica Press family guides, with color plates found separately (with facing page captions) from the text, giving the feeling this is meant to be a field guide. The paintings are by Gerald Driessens, who was listed as a co-author of the first edition but that co-authorship was dropped without explanation in this second edition. Some of the plates of swifts are okay, and one was significantly upgraded in the second edition, but overall they were underwhelming. My detailed review of this 2nd edition of Swifts appeared in Auk 118:274-277 (2001), and I considered the Apodidae text in some detail. Short version of my review: the book is pretty good for Old World species (but there are exceptions), very uneven on South American species, and inexcusably poor on North American species. My full review is available via pdf on-line. The family is now well-covered by Phil Chantler, who authored the Pica Press book, in the Handbook of the Birds of the World series (Chantler 1999). In some respects the color plates were improved over the Driessens' pages in HBW. There is an extensive family text and some great color photos. For this family, I think that the HBW chapter is superior to the Pica Press book, except, perhaps, for the greater attention to subspecies in Chantler (1998). Chantler, P. 1999. Family Apodidae (Swifts), pp. 388 –457 in Handbook of the Birds of the World (del Hoyo, J., A. Elliott & J. Sargatal, eds). Vol. 5. Lynx Edicions, Barcelona, Spain. Hunter, J.E., D. Fix, G.A. Schmidt, and J.C. Power. 2005. Atlas of the Breeding Birds of Humboldt County, California. Redwood Region Audubon Soc., Eureka, CA. Maríin, M. 2000. Species limits, distribution, and biogeography of some New World gray-rumped spine-tailed swifts (Chaetura, Apodidae). Ornitologia Neotropical 11: 93-108. Roberson, D., and C. Collins. "Black Swift," pp. 250-253 in California Bird Species of Special Concern (W.D. Shuford & T. Gardali, eds.). Studies of Western Birds 1. Western Field Ornithologists, Camarillo, CA, and Calif. Dept. Fish & Game, Sacramento, CA. Sterling, J., and W.C. Paton. 1996. Breeding distribution of Vaux's Swift in California. West. Birds 27: 30–40.